The UCC football program is willing to commit to any student-athlete who strives for excellence on and off the field. With the best facilities, technologies and coaching in Ontario, our staff and players are proud to carry forward a tradition of excellence that has been associated with the College since 1829. The coaching staff is unparalleled for any school. Its five full-time coaches played at the college level. There’s also a full-time strength and conditioning coach who works with boys on- and off-season at the best high school facility available. 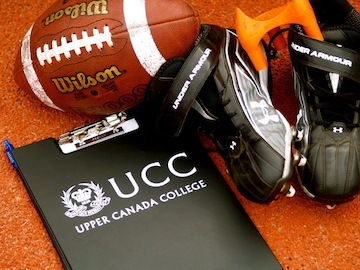 UCC lives and breathes football 24-7, with practices five days a week and games on Saturday. It’s no surprise that so many Old Boys have moved on to play football in Canadian Interuniversity Sport and National Collegiate Athletic Association. Grade 7 Football Classic: This three-day event is an introduction to football. The Football Classic culminates with a seven-on-seven football tournament. Grade 8 Seven-Man Football: The Grade 8 football team builds a strong foundation in key skills, including catching, throwing and tackling. Grades 9 and 10 (Junior Varsity): Our junior varsity program headed by Vanier Cup champion Mario Sturino further emphasizes skill development and competition as all players have a chance to play in practices and games. Grades 10, 11, 12 (Varsity): As close to a collegiate football experience as one can get, our varsity football program emphasizes highly structured university-style practices, strength and conditioning, studying game film and character development.